The Orthodox Coptic Church is one of the oldest Christian churches. Founded and based in Egypt, the church can trace its beginnings back to 41AD when the apostle, Mark, who also wrote the gospel of the same name, founded a Christian church in Egypt, based in Alexandria. Many believe that the beginnings of the church can be traced back even further to the time when Jesus and his family fled to Egypt to avoid the slaughter of young male children by Herod. The iconic art tradition of Coptic Christians is believed to go back to the early days of the Church and examples of this art can be traced back to at least the 3rd century AD. It is believed that this art was used to instruct a largely illiterate population that was being converted to Christianity from pagan religions, in the stories and traditions of Christianity. It provided a visual means of instruction and understanding in much the same way that stained glass windows were used in Europe during the middle ages. In the first three centuries after the founding of the church, Christianity became a major force in Egypt and there is evidence that many of the temples previously used for pagan worship were assumed by Christianity. It is believed that many of these temples were decorated with art which the Coptic Christians plastered over and painted with their own Christian images. Few examples of this early art remain, in part because early archeologists in Egypt removed much of the Coptic Christian art in order to find the more ancient Egyptian art and paintings. At the same time, Egypt also became the center and the model for the monastic tradition in the Christian church. Many monastic orders were founded in Egypt and their buildings continue to provide some of the earliest examples of Coptic Christian art. The style of Coptic icons is believed to have been influenced not only by the art of ancient Egypt but also by the Greek or Hellenic artistic tradition. Alexandria was originally founded by Alexander the Great when he invaded Egypt in the third century BC. The ancient Egyptians had a tradition of decorating and painting sarcophagi in which they were buried with the best known example being the sarcophagus of Tutankhamen. This was continued during the Hellenic period into the 3rd century AD and many striking examples of these portraits, primarily of Greek residents of Egypt, have been found in graves. These encaustic paintings (made with hot pigmented wax on wooden panels), are known as the Fayum mummy portraits and many of them bear a striking resemblance to later Coptic icons with their large eyes and face-on portraits painted in an almost two dimensional style. In the 7th Century there was a movement in the Coptic Church to eliminate icons from churches on the grounds that they were being worshipped as graven images. No doubt the invasion of Egypt by the Arabs, bringing Islam to the area, also had an influence in this movement. • Large and wide eyes symbolizing the spiritual eye that look beyond the material needs. • Large ears listening to the word of God. .
• Gentle lips to glorify and praise the Lord. • Small mouths, so that they cannot be the source of empty or harmful words. • Small noses, because the nose is sometimes seen as sensual. • Large heads, which imply that the figure is devoted to contemplation and prayer. In the mid 20th century there was a renaissance in Coptic art and culture and Dr. Isaac Fanous, a Christian Coptic artist was foremost in advancing this movement. He taught in the Coptic Institute of Higher Studies in Alexandria where he founded a program to teach these artistic traditions. In addition he developed his own style of iconic art which drew heavily on the historic style of Coptic icons but which has a flatter and at times almost abstract feel and appearance. Adel Nassief is a graduate of Dr. Fanous’ program. 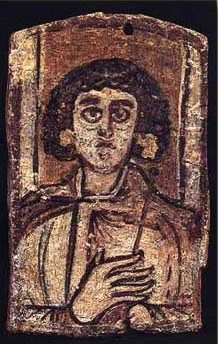 His creation of the images for First Christmas followed the traditional Coptic artistic approach. The paintings were created on wood panels initially prepared with several coats of gesso. The planned image was then drawn on the panel with pencil. The colors were then painted using tempura paint painting the lighter colors first and then going to the darker colors. The gold leaf is then placed on the painting, a difficult process requiring much patience. Finally the painting is sealed with a clear sealer. In the iconic (not just Coptic) tradition the creation of an icon is described as a process of “writing” the icon rather than painting it. The “writing” of the icon is seen as a spiritual experience requiring prayer and contemplation. Often the artists will start their “writing” with a prayer to the individual who is being portrayed in the icon. Throughout the writing there is prayer and meditation, an essential part of the creative process. It is not just an artistic but also a spiritual creation. When you look at Adel Nassief’s work for First Christmas, you can’t help but be drawn to his icons. There is a genuiness about them that places you firmly in the time and place of the events. By drawing on the ancient and spiritual traditions of his art, Adel has managed to create images that are able to touch your heart. In the process they give us a better understanding of the extraordinary events that transpired in the small town of Bethlehem over 2000 years ago.